“Who Stole the People’s Money?”—Do Tell. N. Y. Times. / ’Twas Him. 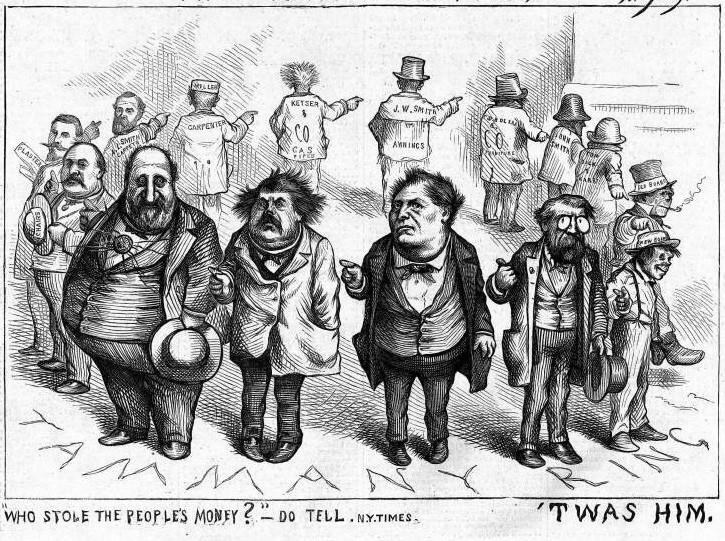 Boss Tweed and the Tammany Ring, caricatured by Thomas Nast. Harper’s Weekly, August 18, 1871. The 1870 New York gubernatorial election pitted the Democratic incumbent, John T. Hoffman, against the Republican, Stewart Lyndon Woodford, a decorated Civil War veteran and former lieutenant governor. Previously the mayor of New York City (the last to become governor of the state), Hoffman was closely connected with Boss Tweed’s Tammany Hall political machine and won the election with over 52% of the vote. Two years later, however, Hoffman would be drummed out of office after The New York Times ran a series of exposés on Tweed’s corrupting influence over regional politics and the embezzlement of tens of millions of dollars in taxpayer funds. What’s not as well known about the 1870 election is Mark Twain’s brief entry into the race for governor—at least in an imaginative piece published shortly after the election. “Running for Governor” appeared as his monthly column for Galaxy magazine and in the local Buffalo Express newspaper, and it was thereafter widely reprinted. (In some versions, the names of the major party candidates were changed to “John T. Smith” and “Blank J. Blank.”) It would not be the only time Twain mocked Governor Hoffman in his writing. The following year he published Mark Twain's (Burlesque) Autobiography and First Romance, which included illustrations that had nothing to do with the text: caricatures of various robber barons and politicians (including Hoffman) captioned with lines from the nursery rhyme “The House that Jack Built.” Two years later Twain had second thoughts about the book as a whole, considering it one of his lesser efforts, and had the plates destroyed. A few months ago I was nominated for Governor of the great State of New York, to run against Stewart L. Woodford and John T. Hoffman, on an independent ticket. I somehow felt that I had one prominent advantage over these gentlemen, and that was, good character. . . . If you don't see the full story below, click here (PDF) or click here (Google Docs) to read it—free! I wanted to say thanks to LOA for publishing such great stories every week. And of course this offers some comic relief during a very serious time. Balance.